Improved Performance and Dynamics with improved steering feel, available Adaptive mode and all-new 4-cylinder and 6-cylinder TwinPower Turbo engines, with an output increase of 35 hp on the 6-cylinder. 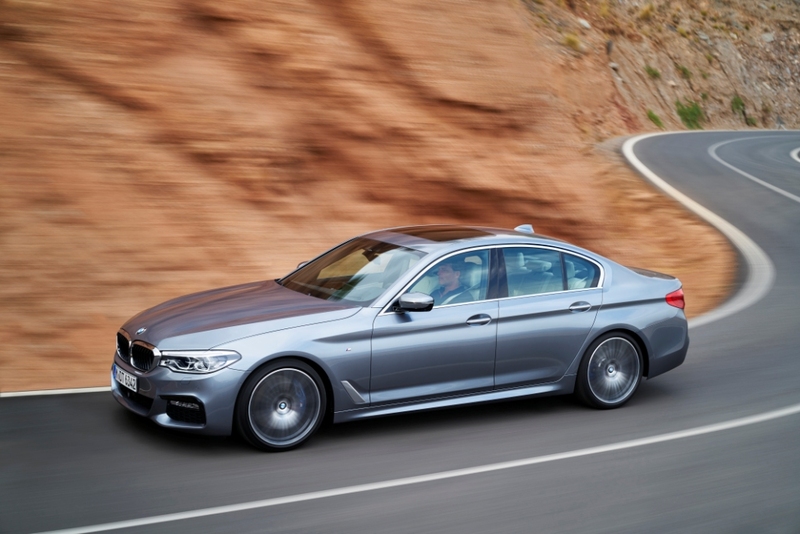 Faster Acceleration by up to 7/10th of a second on the BMW 540i xDrive model. Weight Reduction of up to 137 lbs through extensive use of high-strength steel, aluminum and magnesium. Latest iDrive 6.0 system and improved Driver Assistance Systems. The formula for success continues with the 7th generation of the most successful premium sedan, the all-new BMW 5 Series. Over 7.6 million BMW 5 Series have been sold worldwide since 1972 and since 1975 over 1 million units in the U.S. alone. The 2017 BMW 5 Series has been entirely newly developed allowing for a significant weight loss of up to 137 lbs with the use of magnesium, aluminum and high-strength steel. 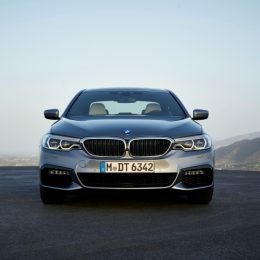 Thanks to the available state of the art chassis systems including Integral Active Steering now combinable with xDrive (BMW’s intelligent all-wheel drive system), Driver and Parking Assistance Systems and Adaptive Mode including Dynamic Damper Control, the all-new BMW 5 Series once more defines the athletic and executive design of a true sport sedan. Featuring a new user interface (iDrive 6.0), Gesture Control, the latest generation of Head-Up Display, Remote 3D View and an improved Voice Control with natural voice input, the 2017 BMW 5 Series marks a new era of personalized connectivity. The BMW 5 Series is the most innovative BMW 5 Series to date, combining unique driving dynamics using Remote Control Parking and Advanced Driver Assistance Systems clearing the way towards semi-automated driving. The all-new BMW 5 Series will be available at U.S. dealers in February 2017. Pricing will be announced closer to market launch. The all-new BMW 5 Series Sedan remains the quintessential midsize sport sedan. “The new BMW 5 Series will make a mature, confidently stylish and dynamic impression at every opportunity. The formal and precise design combines presence, aesthetic appeal and functionality in equal measure,” says Karim Habib, Head of Design BMW Automobiles. The exterior dimensions of the new car are only slightly larger than those of its predecessor. The new BMW 5 Series Sedan is 1.2 inches longer than the outgoing model 0.3 inches wider and 0.6 inches taller. Its wheelbase measures 117.1 inches (+0.2 inches). LED Adaptive headlights as standard. The familiar BMW kidney grille is flanked by twin circular headlights with the headlight housings now connecting seamlessly with the kidney grille, emphasizing the car’s width. The standard LED Adaptive headlights already make the BMW 5 Series a captivating prospect, its concentrated gaze locked onto the road. Adaptive Full LED Headlights alter the light graphic and can be specified as an option. With Adaptive Full LED Headlights, the LED tubes of the daytime running lights are hexagonal and extend to meet the kidney grille, creating a stylistic connection that accentuates the wide, low-to-the-road appearance of the front end. The side view: short overhangs, elongated silhouette. The passenger cell is set back and leads the eye over a flowing roofline to the rear end, while a short front overhang underscores the car’s sporty appearance. 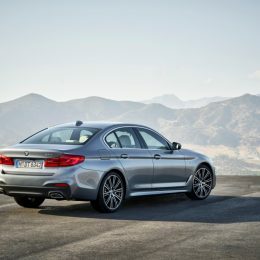 “For the first time, the new BMW 5 Series Sedan brings together two traditional BMW design elements which are normally separate from one another. The swage line turns up as it heads rearwards, moving from shadow to light and sweeping up the Hofmeister kink in its path rather than continuing into the rear. This upwards motion lends the car a forward-surging character, and the expressive, swooping surface imbues it with an undeniable muscularity,” explains Habib. The rear: a visually lower center of gravity. The low-slung, expressive and width-accentuating design of the rear end points to the dynamic, direct handling of the new BMW 5 Series Sedan. The rear lights reach deep into the sides of the car, creating a visual connection between its flanks and rear end. Cutting-edge LED bars enable a slim interpretation of the hallmark BMW “L” shape and underline the width of the new sedan. Another defining element of the rear end are the exhaust tailpipes, which are now arranged symmetrically on both sides on all model variants. Depending on the engine and equipment package specified, the tailpipes will be circular (four-cylinder engines) or trapezoidal (six-cylinder versions and cars with the M Sport package). The Air Curtains in the front apron team up with Air Breathers to cut air turbulence in the wheel arches significantly and channel the air effectively as the car pushes through it. Aerodynamic efficiency, courtesy of optimized trim and airflow-channeling elements which are fitted across the whole of the underbody; provide a considerable degree of underbody sealing. This also reduces lift, which enhances dynamics at high speeds. A total of 13 colors, wheels in 18-inch, 19-inch and 20-inch sizes. Two non-metallic and 11 metallic color shades are available for the new BMW 5 Series. Customers can choose from a total of 4 different light-alloy wheels (18-inch, 19 inch and 20-inch). The standard Sport design shines the spotlight on the car’s dynamic character and stands out with numerous trim elements in high-gloss black and 18-inch Double Spoke light-alloy wheels (optional 19-inch in a bi-color polished finish). Chrome window surround, chrome kidney grill bars, and front & rear bumper trim finishers on the exterior and SensaTec upholstered dashboard on the interior enhances the sporty character of the all-new BMW 5 Series. On the interior, standard Sport Seats with power adjustable side bolsters and an Anthracite headliner welcome the driver and front passenger. The M Sport package will be available from launch. It includes the M Aerodynamic kit (front apron with larger air intakes, side skirt trim, a diffusor-style rear apron and an exhaust system with two rectangular tailpipes), Shadowline exterior trim, lowered M Sport suspension and 19-inch M Double-Spoke Wheels with Mixed Performance Run-Flat Tires or all-season Run-Flat Tires. The interior includes a new M Sport leather steering wheel, a SensaTec upholstered dashboard and aluminum pedal covers and footrest, with exclusive floor mats when selecting the option of Black Dakota Leather with contrast Blue stitching and piping. Luxury travel: more freedom of movement, low noise levels. 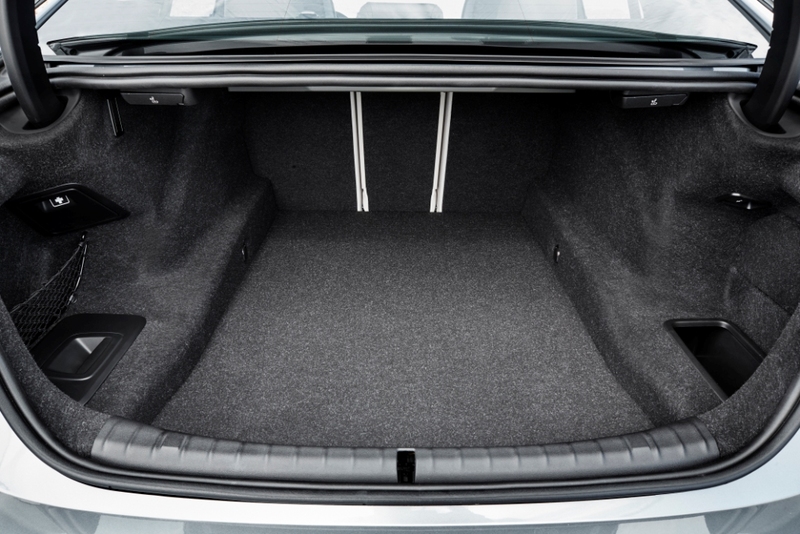 The all-new 5 Series offers increased trunk capacity (18.7 cubic feet), capable of carrying 4 golf bags. The lowered instrument panel, freestanding display, and the cabin’s enlarged dimensions provide additional room and comfort. Passangers in the rear now have more space to spread out, thanks to the increased kneeroom and extended legroom (+1.2 inches). As part of the interior’s acoustic design the headliner is equipped with built-in sound absorbing materials to reduce interfering sounds, which increases the driver and passenger’s ability to communicate. Additional storage spaces in the door pockets, able to hold regular sized bottles, have been created. The cupholders in the center console have been designed to allow easy access control switches. The storage compartment in front of the cupholders can be equipped with an optional wireless charging tray. The standard front Sport seats are 16-way electrically adjustable, including adjustable side bolsters for optimum lateral support, and offer tremendous safety and comfort together with a wide choice of materials. 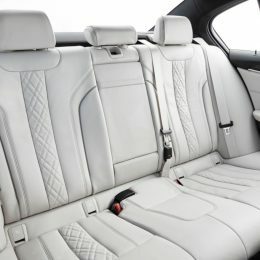 Other enhancements inlcude decorative stitching for the optional Dakota and quilting for the optional Nappa leather upholsteries can be selected. The available 20-way adjustable Multi-contour seats for the driver and passenger can be additionally equipped with ventilation and massage function. Eight different massage programs, each with a choice of three intensity modes, relax the muscles in the back and relieve the strain on the spinal discs while driving. The massage function uses 20 air chambers incorporated into the seat backrest and cushion, which are alternately inflated and deflated. The driver is now able to set temperature thresholds for activating the seat heating and seat ventilation, as well as the steering wheel heating – a highly convenient feature that starts these functions automatically when the temperature falls below or rises above the respective limit. 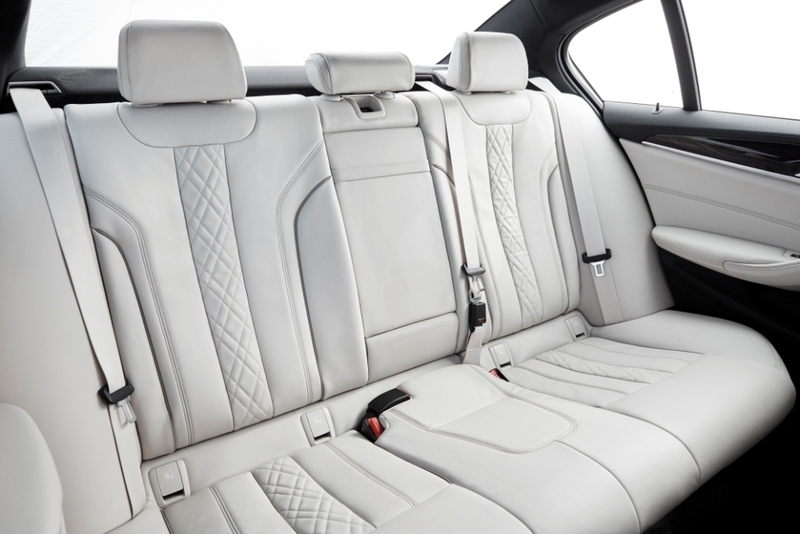 There is room for up to three adults on the rear seats. When the middle seat is not occupied, rear seat passengers can make use of the center armrest and its integrated cupholders. Contact sensors for the seat control. When equipped with Multi-contour seats, new seat adjustment switches contain touch-sensitive sensors. Touching the switch located on the outside edge of the seat, activates one of five sensors and the corresponding menu opens in the iDrive display. Lightly pressing on the switch again then carries out the desired adjustment, all clearly illustrated by a matching animation in the display. 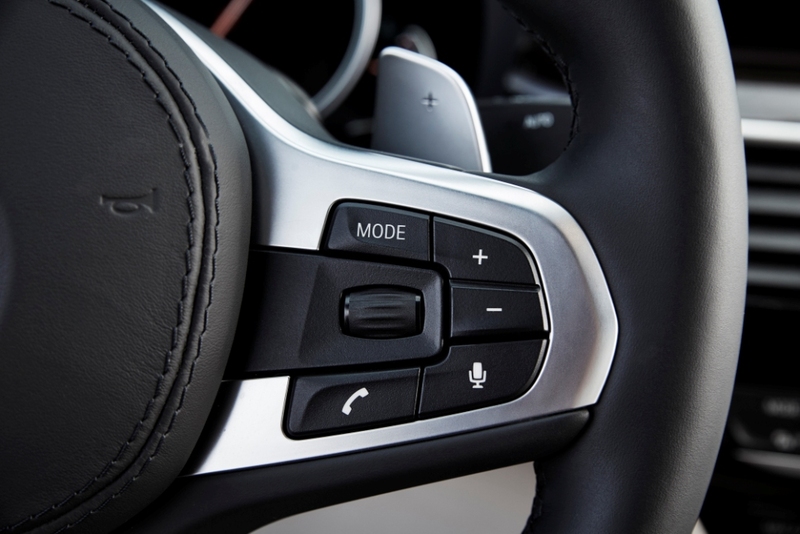 Gesture control, Intelligent Voice Control, Touch screen and iDrive 6.0 touchpad Controller. 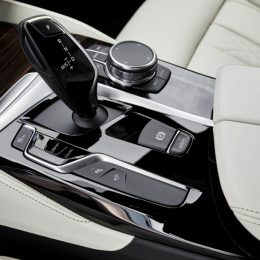 The latest version of Gesture control which premiered last year in the all-new BMW 7 Series is now available as an option in the all-new BMW 5 Series. Navigation, telephone, entertainment features and vehicle functions can be visualized on the standard high-resolution 10.25-inch screen and controlled not just in the usual manner using the iDrive Controller, but also by means of gestures, voice commands or simply touching the display. Available content is arranged in a total of six large tiles over two screen pages, providing the driver with direct access to functions as well as a live display of the associated content. The interactive and live tile for entertainment, for example, shows the current song selection with an image of the album cover. When navigation is active, the driver can see the route the vehicle is taking in the main menu’s navigation tile. If the driver now touches this map section, the navigation screen opens, showing the detailed map view. Touching a tile’s header line, opens the respective function’s main menu, in this case the navigation menu. This allows for easy and quick access to all information stored, saved or currently enabled. The two sets of three pads can be rearranged as desired, allowing drivers to position the content they use most frequently in the first screen. Users select menu options and the associated functions in the usual way with the iDrive Controller or by simply tapping the button on the iDrive Touch screen with their finger. The all-new BMW 5 Series can also be operated using voice control or with optional Gesture Control which offers a particularly intuitive and easy way of operating commonly used infotainment system and telephone functions. All that is needed are simple movements of the hand or fingers, which are detected by a 3D sensor in the vicinity of the center console and translated into commands: pointing at the screen with the index finger is all it takes to accept a phone call, for instance, while a swiping motion with the hand rejects it. The swiping action can also be used to open submenus. Tracing a circle with the index finger adjusts the audio system’s volume, and the driver can pull their thumb and index finger away from the navigation map towards them to zoom in on that section of the map. In addition, the two-finger point towards the iDrive screen can be used to carry out an individually selectable command, such as instructing the navigation system to start route guidance to the home address or skipping to the next track in a playlist. The Intelligent Voice Control offers the most advanced level of natural voice control currently featured in a BMW. Now, the driver can formulate their request in everyday language and simply ask, for example, where the nearest Italian restaurant is located. Intelligent Voice Control is currently available in English, Spanish and French. In the all-new BMW 5 Series, drivers can see Advanced Real-Time Traffic, navigation instructions, warnings from the driver assistance systems, phone lists and the audio track selection. A wealth of information is being projected onto the windshield when activated. With a resolution of 800 x 400 pixels, the projection area is around 75 percent larger than on the outgoing model. The all-new BMW 5 Series Sedan is equipped as standard with two-zone automatic climate control featuring independent temperature control for driver and front passenger and automatic activation of the air recirculation function whenever necessary. The standard Ambiance lighting feature includes colored LED light, providing illumination of the interior and accentuating its design contours, particularly around the instrument panel and the doors. There is a choice of eleven different lighting effects with six different light colors, and the brightness can also be adjusted individually. Surround sound delivers flawless acoustics. For the first time, a surround sound system from Bowers & Wilkins with diamond tweeters is available in the all-new BMW 5 Series range. This optional high-end audio system is renowned for delivering excellent acoustics. The 10-channel amplifier feeds a total of 16 speakers with brushed stainless steel grilles sporting the exclusive Fibonacci-patterned holes, which illuminate when the system is switched on. A measuring microphone is built into the car to allow the acoustics to be precision tuned to the specific conditions – for example, the number of occupants – in order to create a flawless surround sound experience for everyone in the car. The 1,400 watts can be matched to the selected music genre. Alternatively, there is the option of a nine-channel sound system with 16 speakers and a total output of 600 watts from Harman Kardon, as well as the standard 205 W, eight-channel HiFi system with 12 speakers. The optional Rear-Seat Entertainment Professional system offers occupants in the rear the luxury of two independently controlled, high-resolution 10.2-inch screens with DVD player, which now includes support for BluRay® discs and HDMI connections, plus connections for MP3 players, USB devices, games consoles and headphones. Passengers can also access the vehicle’s entertainment functions, such as the radio. 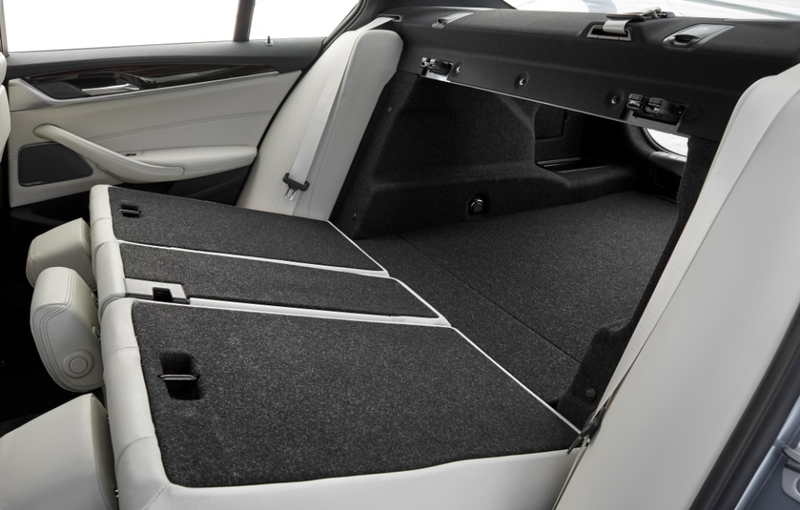 The all-new BMW 5 Series Sedan boasts a larger 18.7 cubic feet trunk. 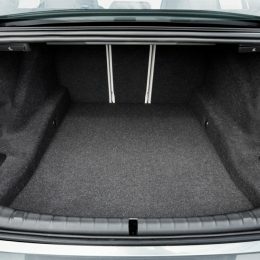 The lowered trunk sill in combination with the increased trunk space and width ensure that even bulky items can be loaded easily. Thanks to the standard split-fold-down rear seats which allow the rear backrest to be folded flat with a 40:20:40 split for maximum flexibility, carrying longer cargo items, such as skis or snowboards is possible. The automatic opening and closing function triggered with either the key or a gentle forward-backward kicking motion underneath the center of the rear bumper is available as an option. New engine family with BMW TwinPower Turbo technology. All members of the newly developed, modular BMW EfficientDynamics engine family feature an extremely lightweight, thermodynamically optimized all-aluminum construction. Thanks to their unrivalled BMW TwinPower Turbo technology, they meld maximum power with exemplary efficiency. These gasoline engines employ twin-scroll turbocharging, High Precision Injection, Double-VANOS variable camshaft control and Valvetronic fully variable valve timing. 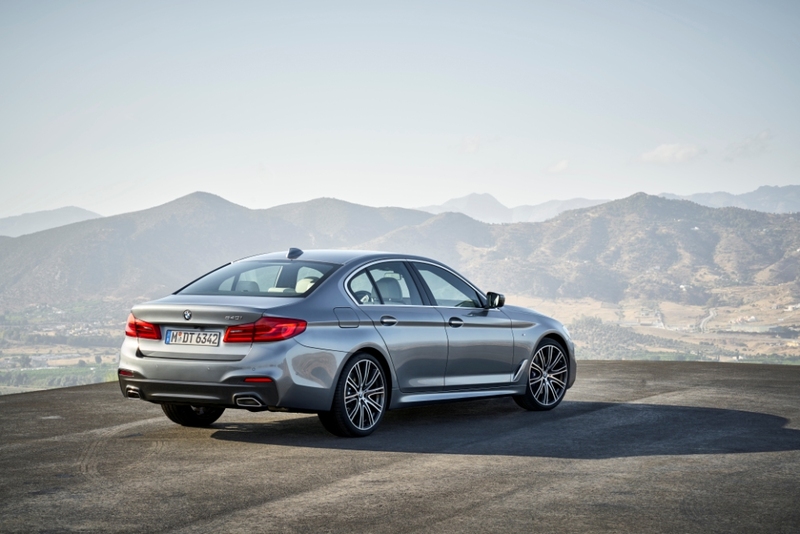 BMW 530i and BMW 540i: new four and six-cylinder gasoline engines. The new 2.0-liter 4-cylinder inline engine in the BMW 530i supersedes the gasoline unit previously fitted in the BMW 528i. The turbocharged direct injection engine delivers its peak output of 248 hp between 5,200 and 6,500 rpm, and puts its maximum torque of 258 lb-ft on tap from 1,450 rpm all the way up to 4,800 rpm. The BMW 530i sprints from 0 to 60 mph in 6 seconds (5.8 seconds with xDrive) and reaches a top speed of 130 mph and, with M Sport Package and 19-inch M Double-Spoke Wheels with Mixed Performance Run-Flat Tires, the electronically-limited top speed is increased to 155 mph. The range-topping engine for the time being can be found in the new BMW 540i and generates 335 hp (+35 hp increase) between 5,500 and 6,500 rpm. The 3.0-liter inline 6-cylinder musters up a mighty 332 lb-ft of torque from 1,380 – 5,200 rpm. The BMW 540i sedan powers from 0 to 60 mph in just 4.9 seconds and top speed is electronically-limited to 130 mph, 155 mph with M Sport Package and 19-inch M Double-Spoke Wheels with Mixed Performance Run-Flat Tires. 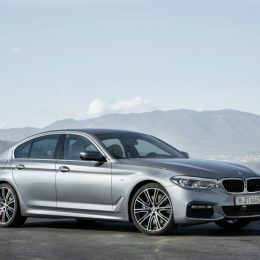 At 4.7 seconds for the sprint from 0-60 mph, the all-wheel-drive BMW 540i xDrive bests its predecessor (535i xDrive Sedan) in acceleration by 7/10th of a second. All the engines available at launch with BMW xDrive intelligent all-wheel drive. BMW xDrive counteracts oversteer and understeer effectively and increases the car’s pulsating handling abilities when turning into corners and eagerly powering out of corners. The BMW all wheel drive system provides the perfect blend of dynamism, directional stability and comfort. For the first time, BMW xDrive can be combined with Integral Active Steering as well as the lowered M sport suspension included in the M Sport Package. 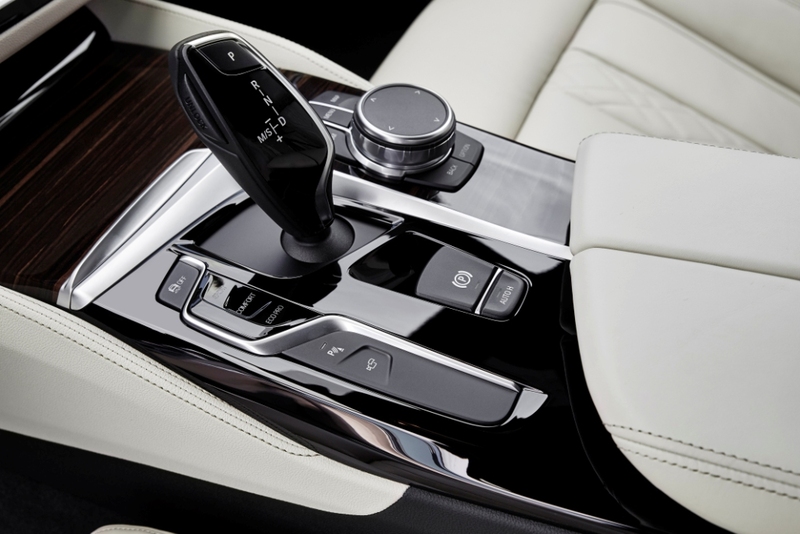 The Sport variant of the eight-speed Steptronic automatic transmission comes standard on the new BMW 5 Series Sedan and features even more dynamic shift characteristics along with shift paddles on the steering wheel for changing gear manually. This technology is best exemplified by the ECO PPRO mode with ECO PRO Tips, which can be activated with the Driving Experience switch. It is interlinked with the Navigation system Professional, enabling it to detect road topography. Such measures are accompanied by intelligently controlled energy and climate management. The active kidney in the new BMW 5 Series allowing even more variable control of the cooling air for engine, brakes and air conditioning to suit the situation. Aside from its aerodynamic benefits, the system also shortens the engine’s warm-up phase and makes sure that heat is retained for longer after the engine has been switched off. Chassis and Driver Assistant Systems. In its 7th generation, the BMW 5 Series features, a redesigned chassis, intelligent lightweight engineering, BMW’s renowned even weight distribution, a highly torsion-resistant body and leading edge driver assistant systems. The BMW engineers have succeeded in making the car’s handling more agile and precise, yet without compromising the comfort which is a hallmark of this sport sedan. At the same time, an extensive range of driver assistance systems take the BMW 5 Series Sedan a big step further down the road with improved semi-automated driving features. “The BMW 5 Series is the most successful business sedan on the planet. It brings together sporting agility, presence and comfort like no other vehicle. With the new generation of the car we are once again setting the benchmark in all areas; it combines dynamic excellence and comfort to the best possible effect. 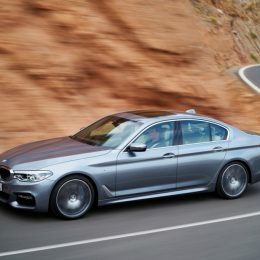 Plus, the new BMW 5 Series Sedan is at the leading edge of technology when it comes to driver assistance and connectivity. 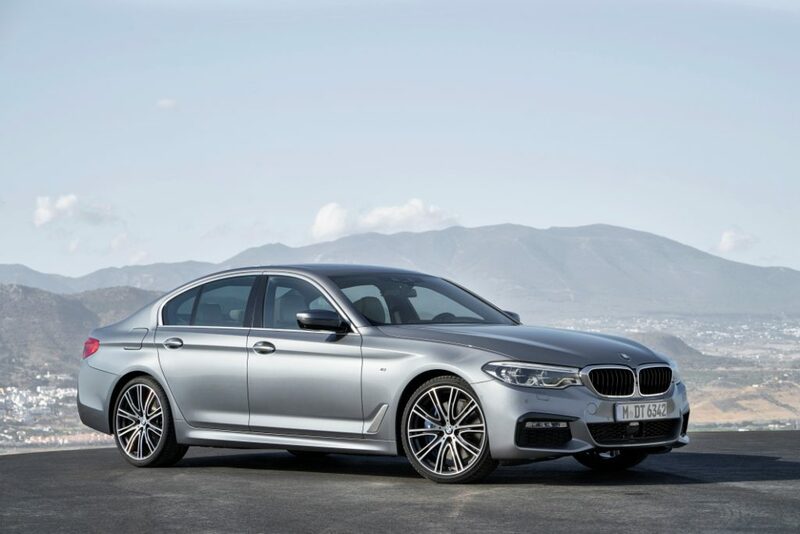 So it promises to remain the most successful business sedan in the market,” says Klaus Fröhlich, Member of the Board of Management at BMW AG, Development. Double-wishbone front suspension and five-link rear suspension. The wheelbase of 117.1 inches shows a slight increase over the previous 5 Series, while front and rear track width of 63 / 63.9 inches (+/- 0 front / -0.2 rear) are roughly on par. The new double-wishbone front axle’s kinematics are perfectly configured for a long-distance sedan. Extensive use of light-metal components keep unsprung mass as low as possible, while separating the construction into an upper and a lower control arm level gave the engineers considerable freedom to fine-tune the balance between dynamics and comfort. The spring struts are not required to perform wheel position functions, so only have to handle minimal transverse forces. The suspension therefore delivers finely controlled responses to bumps in the road. With small kinematic lever arms that minimize disturbance torque around the steering axis, the new BMW 5 Series Sedan offers the driver excellent steering feel with clear road feedback. The rear suspension and double-wishbone front suspension work together to provide excellent anti-roll control when cornering, but never at the expense of ride comfort. Light-metal components are also used extensively in the new five-link rear suspension, which is even lighter and stiffer than in the previous model and provides precise wheel location and excellent tracking stability in all driving situations. The specially calibrated elastokinematics, the large axle sub frame mounting and supporting system, the compression strut connecting the suspension and body and the high structural stiffness combined with low unsprung masses create an excellent overall balance between agility and comfort. The large mounting and supporting system also plays an important part in ensuring good acoustic insulation between the powertrain and suspension. Thanks to this efficient decoupling, the new rear axle also contributes to the excellent acoustic comfort on board the BMW 5 Series Sedan. Integral Active Steering now also available in combination with BMW xDrive. The all-new BMW 5 Series features an electromechanical power steering system with variable steering ratio and speed-sensitive power assistance. Optionally, the BMW 5 Series can now also be equipped with a revised – now electromechanical – Integral Active Steering system, with steering rear wheels for extra agility, stability and comfort. Integral Active Steering gives the new BMW 5 Series Sedan excellent directional stability on highways, while around town the steering response is pleasingly light and agile. Integral Active Steering can now also be combined with BMW xDrive. Tailored dynamics and comfort for suspension and brakes. The new BMW 5 Series is fitted with optimized lightweight brakes. Depending on the model variant, they feature single-piece or two-piece four-piston fixed aluminum calipers at the front, with lightweight discs, and single-piston calipers with an integrated electromechanical parking brake at the rear. The BMW 5 Series rides on 18-inch Double Spoke wheels with All-Season Run-Flat Tires as standard, with All-Season non Run-Flat Tires, including a space saver spare tire under the trunk floor, now available as a no-cost option. 19-inch V-Spoke Bi-Color wheels with All-Season Run-Flat or mixed performance Run-Flat tires are available as a no cost option. Vehicles equipped with M Sport Package come with 19-inch M Double-Spoke wheels with All-Season Run-Flat or mixed performance Run-Flat tires. On 540i models equipped with M Sport Package, a 20-inch V-Spoke Wheel with mixed performance Run-Flat Tires are additionally available as an upgrade option. A lowered M Sport suspension is included with M Sport Package, and is now combinable with 4-cylinder models as well as BMW xDrive. The available Dynamic Damper Control system, which is equipped with new valves and an optimized control algorithm, matches the damping characteristics to the road surface and driving situation. At the same time, the Driving Dynamics Control switch allows drivers to choose between sportier or more comfort-oriented suspension settings. Debut for electromechanical anti-roll stabilization. The optional Adaptive Drive system, which combines Dynamic Damper Control, provides unsurpassed dynamics and comfort. In contrast to the previous active roll stabilization system, the anti-roll bars are now no longer actuated hydraulically but by means of electric swivel motors. The new system is fast-acting and precise, is lighter overall in weight and is much more frugal in its energy consumption. In addition to enhancing the driving dynamics of this sport sedan, active roll stabilization also improves comfort in driving, by actively countering bump disturbances affecting only one side of the car. On winding roads, the new BMW 5 Series Sedan offers even greater precision and agility that makes for excitingly nimble handling whenever sporty driving is required. By automatically adjusting to a wide range of driving conditions, Adaptive Drive enhances handling safety and stability, and provides excellent suspension comfort. New modes and functions for Driving Dynamics Control. The Driving Dynamics Control switch allows drivers to choose between sporty, comfortable or efficient modes, depending on the driving situation and personal preference. 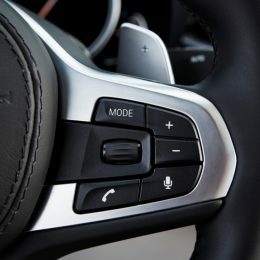 These modes – Comfort, Sport, ECO PRO and, optionally, Adaptive (if Dynamic Damper Control is equipped) – can be selected at the touch of a button. Each mode activates a predefined set-up for the relevant powertrain and chassis components. The Sport and ECO PRO modes can be further differentiated using the iDrive Controller, which allows the powertrain and chassis settings to be configured separately. In the new Adaptive Mode, the steering, Dynamic Damper Control and Steptronic transmission are automatically adapted to the driving style and, depending on vehicle specification, also to the route. The control logic reacts to inputs such as accelerator and steering commands, or gear selector position, to vary the powertrain and chassis characteristics between sporty and more comfort-oriented. Also, data supplied by the Navigation system Professional is used to proactively adapt the settings to take account of upcoming bends and intersections, or different types of road, such as highways or roads. State-of-the-art driver assistance systems for maximum comfort and convenience. The all-new BMW 5 Series features an unusually large number of automated functions for a vehicle in this segment. These functions monitor the vehicle’s environment using a combination of a forward facing stereo camera mounted on the windshield near the rear-view mirror and optional radar and ultrasound sensors. Active Cruise Control with Stop & Go for all driving situations. Dynamic Cruise Control (DCC), which is standard on the BMW 5 Series Sedan, maintains any selected speed between 19 – 130mph. It also supports energy-saving coasting by decoupling the engine from the powertrain when the driver lifts off the accelerator at higher speeds. The new and improved Active Cruise Control (ACC) with Stop & Go uses radar to adjust the pre-selected speed to the traffic situation. The system operates at all speeds up to 130 mph and is capable of braking to a standstill in stop & go traffic and automatically senses if the vehicle in front is moving once more. If the vehicle has been placed into standby mode by pushing the resume button on the steering wheel, the all-new BMW 5 Series can automatically start moving again up to 30 seconds after coming to a full-stop. The ACC system now also takes into account highway exits and traffic circles, where it adjusts the acceleration dynamics to suit these special traffic situations. The control technology monitors two vehicles ahead so that vehicle speed can be adjusted earlier and smoother. Heating elements ensure that the front-mounted radar sensor remains fully operational even if snow is falling. The Lane Departure Warning system operates at speeds between 40 – 130 mph. If the forward-facing stereo camera detects that the vehicle is straying from its lane, Active Lane Keeping Assistant helps the driver steer back on course with smooth and seamless steering interventions. Utilizing the Blind Spot Detection system (12-130 mph), when switching lanes, Active Lane Keeping Assistant with Side Collision Avoidance steers the vehicle back into its lane if its sensors detect another vehicle in the next lane. Side Collision Avoidance, which operates at speeds between 40 and 130 mph, warns drivers by means of a visual signal or steering wheel vibration if another vehicle has drifted too close to the side of the vehicle. If the system detects sufficient room on the other side of the vehicle, it correctively steers the vehicle in this direction and out of possible accident prone situations. This corrective steering assistance can be overridden at any time by the driver. Evasion aid: evasive steering around obstacles. Another new function contained with Active Cruise Control with Stop & Go + Active Driving Assistant is the evasion aid. If a quick lane change is required, for example when the vehicle in front brakes aggressively, the evasion aid – which operates at speeds up to 100 mph – supports the necessary evasive steering action. Faster steering and counter steering during an evasive maneuver results in less vehicle instability, supported by Dynamic Stability Control (DSC). While executing the maneuver, the evasion aid also uses information from the vehicle’s sensor systems to check how much unobstructed space is available around the vehicle. At speeds over 100 mph, the system no longer provides actual steering support and instead focuses on maximizing vehicle stability. Active Lane Keeping Assistant & Traffic Jam Assistantsemi-automated steering. Two systems, providing a semi-automated driving capability are Active Lane Keeping Assistant & Traffic Jam Assistant. Together, these systems operate between 0 – 130 mph and uses smooth, comfort-enhancing steering interventions to keep the vehicle in lane. The latest generation of the system features improved image recognition and software algorithms to keep the vehicle reliably on course. In certain situations, particularly in stop-start traffic, the system also uses the vehicle in front as an additional reference point. In very heavy or stop & go traffic, the Active Lane Keeping Assistant & Traffic Jam Assistant reduces driving stress. The system’s hands-on-wheel detection is very sensitive, and can identify hand contact even when only a few fingers are touching the wheel. BMW ConnectedDrive and business technologies. The all-new BMW 5 Series Sedan sets new standards for connectivity between the driver, vehicle and outside world. The already extensive portfolio of BMW ConnectedDrive Services has been expanded to include new products that are designed to bring added comfort and efficiency. Perfect parking: remote controlled or automatic. The Remote Control Parking feature enables drivers to park in narrow spaces without the hassle of getting in or out of the vehicle. Utilizing the Display Key, the all-new 5 Series is easily maneuvered into the parking spot with the driver only having to position the vehicle in front of the desired parking space. The driver can then start/stop the engine and oversee the control of the function operation from outside the vehicle. All acceleration and braking actions are monitored and controlled by the Park Distance Control (PDC), the Parking Assistant and the Surround View sensors, while the engine can be started and switched off with the Display Key. This doesn’t make much sense maybe say something about this at note and delete it from here. The available Parking Assistant enables automated parking with the greatest of ease in both parallel parking spaces and perpendicular. Potential parking spaces now only have to be around 30-inches longer than the vehicle itself to be eligible, meaning that the system can maneuver the car into even smaller spots than before. The ultrasonic sensors detect suitable parking spaces up to a speed of 22 mph. The system then takes care of the entire parking procedure, including all necessary steering inputs, gear changes, acceleration and braking. In the case of parking spaces that are perpendicular, the system needs only around 15-inches of free space to each side of the car to trigger automated parking. Surround View and Remote 3D View offer peace of mind by allowing owners monitor their BMW 5 Series at all times. The system shows a bird’s-eye view of the driver’s car as well as a three-dimensional image of the area surrounding the vehicle. Any obstacles, including curbs, or other vehicles or pedestrians that suddenly appear can be spotted even earlier in this way. With the Remote 3D View technology, these three-dimensional views of the vehicle’s surrounding area can also be downloaded to the owner’s smartphone with the help of BMW Connected App. This fusion of driver assistance systems and connectivity services allows owners to quickly check on their parked car no matter how far away it is, as the image data is transmitted over the cell phone network to their mobile device. ParkNow and On-Street Parking Information. The integration of the ParkNow service means that on-street parking spaces and garages can be easily located, reserved and paid for. Reservations can either be made while en route from the navigation system or in advance via the ParkNow smartphone app or web. Over 150 parking garages are currently affiliated with the ParkNow network in the U.S. alone, with that number expected to grow to over 500 affiliated garages by mid-2017. Once the selection has been made via the navigation system, the driver is directed straight to the chosen parking place and an electronic ticket is generated which grants access to the reserved space. On-Street Parking Information (OSPI) is receiving its world premiere in the all-new BMW 5 Series Sedan. This cutting-edge technology helps to alleviate the problem of vehicles searching for a parking space, which accounts for a large part of traffic congestion in metropolitan areas. OSPI works similar to the Advanced Real Time Traffic Information system, using historical and data to draw conclusions regarding the availability of parking spaces on route within the coverage area. The system then uses a model to predict the odds of finding an open parking spot. A color coding on the navigation map displays the systems suggestions. Wireless charging, Apple CarPlay and the WiFi hotspot. The optional Wireless Charging allows for wireless charging via an inductive charging tray located in the center console in front of the cupholders. A wireless charging case is available from the Original BMW Accessories range for phones that are not yet compatible with this charging technology. Included with Wireless Charging is a WiFi hotspot with a free 3-month trial through AT&T offering a high-speed internet connection (LTE) for up to ten mobile devices. Apple CarPlay compatibility is also available in the BMW 5 Series Sedan. Integrating the smartphone into the vehicle’s iDrive system allows the phone, together with apps that have been approved by Apple for CarPlay, to be operated via the screen in the car by means of the iDrive Controller or Touch screen. BMW is the first carmaker to integrate Apple CarPlay completely wirelessly. The navigation system that keeps learning. The latest generation of the Navigation system Professional boasts quicker start-up, even faster route calculation and more realistic 3D graphics in cities. The navigation system is adaptive, meaning that if the driver keeps diverting from a suggested route, the next time the destination is selected the system will propose the newly learned route as the standard route to the requested destination. Thanks to the automatic map updates (up to 4x annually), which are free for the first three years the navigation maps are updated over the air, i.e. in the background over the mobile phone network using the vehicle’s built-in SIM card. 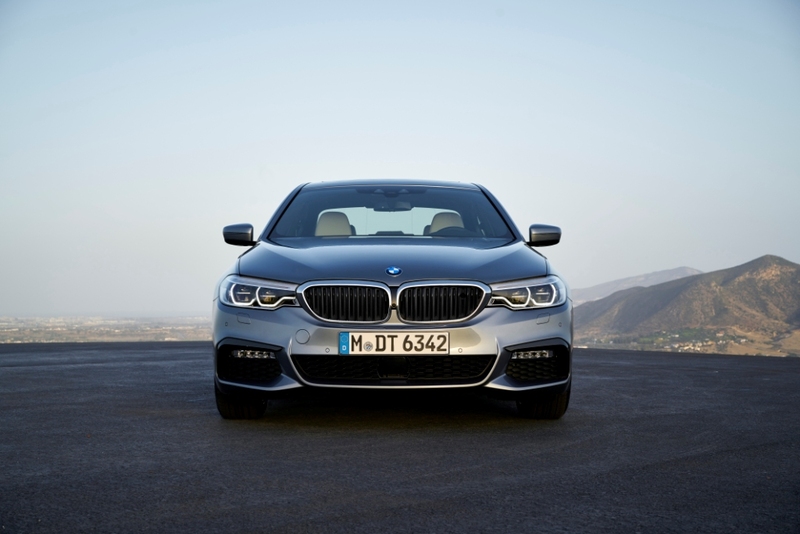 BMW Connected: additional functions for the all-new BMW 5 Series Sedan. With the launch of BMW Connected in the USA in 2016, BMW has introduced an all-encompassing digital concept designed to aid personal mobility. Using a flexible platform called the Open Mobility Cloud as a basis, BMW Connected seamlessly integrates the vehicle into the user’s digital life via multiple touchpoints, such as an iPhone, Apple Watch, and Android smartphone. BMW Connected focuses first and foremost on the digital products and services which simplify the day-to-day planning of driving routes and appointments. The new BMW 5 Series Sedan includes various new functions such as BMW Connected Onboard – a personalized start screen for every driver – and Remote 3D View, which lets users keep an eye on their BMW 5 Series Sedan’s immediate vicinity with a glance at their smartphone. With BMW Connected, mobility extends beyond the vehicle. BMW Connected is a digital assistant that combines the various functions that assist with everyday mobility requirements. It detects mobility-related information, such as the addresses contained in calendar entries, and transmits this automatically to the vehicle. The user then receives a message on their smartphone notifying them in advance of the ideal departure time on the basis of the latest traffic information. In addition, places the user drives to regularly and personal mobility patterns are also stored automatically. This means that manually entering destination addresses in the navigation system is set to become a thing of the past. Assuming that the destination address and desired arrival time have been set outside the vehicle using BMW Connected, the link between smartphone and car means this data is imported seamlessly when the user gets in and is transferred to the BMW navigation system, allowing route guidance to be started directly. The familiar BMW Remote Services have likewise been incorporated into BMW Connected, allowing users to conveniently perform commands such as unlocking the vehicle or setting ventilation of the interior cabin directly from their smartphone. At the root of the BMW Connected concept is a flexible service architecture – the Open Mobility Cloud. This platform builds on Microsoft Azure and processes data and information from all sorts of different sources. With machine learning and data analytics capabilities, it provides the basis for personalization and context orientation of BMW Connected services. With the availability of BMW Connected as an Alexa skill on all Alexa-enabled devices, it is now possible to use voice commands to check the vehicle’s battery charge and fuel level as well as lock the vehicle remotely. The BMW Connected Alexa skill allows users to learn about their next scheduled trip, find out what time to leave, and send the destination to their BMW. ConnectedDrive Services – So connected you’re free. Thanks to the SIM card built into the vehicle as standard, the ConnectedDrive Services offer optimum connectivity and access to the unrivalled portfolio of BMW services without being dependent on the customer’s smartphone. The Concierge Service allows customers to contact live BMW Assist™ concierge while driving, instruct the agent to search for points of interest. The destination is sent directly to the vehicle’s navigation system for route guidance including all the relevant contact details. ARTTI (Advanced Real Time Traffic Information) allows BMW 5 Series drivers to avoid traffic jams the smart way. ARTTI provides traffic information virtually in real time so that drivers receive early notification of changes in the traffic situation and an alternative route will be suggested to the driver. If Dynamic Route Guidance is enabled, the route will be automatically recalculated to a more efficient path. Intelligent Emergency Call, which continues to offer an unrivalled level of service, ensures maximum safety out on the road. If the car’s airbags are triggered in an accident, this system uses the built-in SIM card to automatically transmit the severity of the accident to the BMW Call Center, as well as the potential risk of injury to the occupants and the vehicle’s location. This information is then used to arrange the best possible emergency response, while the Call Center stays in contact with the occupants if desired. The Intelligent Emergency Call can also be triggered manually to summon help swiftly for other road users in emergency situations. Additional services can be purchased through the BMW ConnectedDrive Store. The BMW EfficientLightweight concept has been rigorously applied throughout the new BMW 5 Series Sedan. Using an intelligent multi-material mix consisting of aluminum, high-strength steel and magnesium, up to 137 lbs have been shaved off the weight of the previous model, while body strength and torsional rigidity have been increased. A low center of gravity, a perfectly balanced axle load ratio and a further reduction in unsprung masses have benefits for both dynamics and comfort. Intelligent multi-material mix reduces weight and increases strength. Large load-bearing members in the new BMW 5 Series Sedan, and strategic use of high- and ultra-high-strength steels in the roof, side members and rear, give the body high structural strength. The trunk, trunk lid, engine cross-member, rear side-members, roof and doors are constructed from aluminum. The doors, with laser-cut outer paneling, have an aluminum shell construction, which maximizes the weight-reducing benefits of this material when used in combination with state-of-the-art production technologies. The use of hot-stamped steels, aluminum alloys and multi-phase steels in the passenger cell provides high rigidity, for the best possible passive safety and low weight. The cast magnesium instrument panel support is over 4 lbs lighter than the steel version used on the previous model. For the first time, the trunk lid of the BMW 5 Series Sedan is made entirely of aluminum, bringing a weight saving up to 9 lbs. Over 1 lb have been shed thanks to use of the natural fiber kenaf in the inner lining of the trunk lid. Kenaf’s high recyclability means it is also has a high sustainability factor and is very eco-friendly. 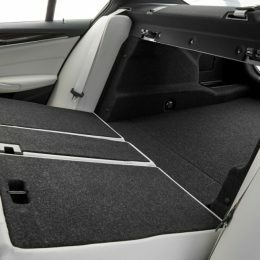 Unique body structure provides unbeatable occupant protection. 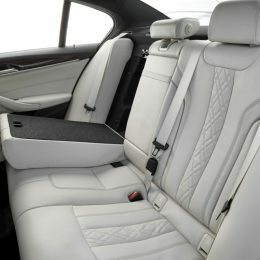 The body structure offers optimized safety both for the vehicle’s own occupants and occupants of other vehicles by utilizing a lightweight designed and state-of-the-art simulation techniques. Deformation spaces are optimally designed and utilized, courtesy of the latest technologies in body design. The aim was to split up the main load paths so that the impact forces are dispersed over as wide an area as possible by the time they reach the extremely rigid passenger cell. This ensures optimal deceleration of the passenger cell in an accident, allowing the front, rear and side impact restraint systems to provide the most effective protection possible. The standard pre-crash accident detection system Active Protection enhances passive safety by detecting potential accident situations as they arise. If a collision risk is detected, the system automatically triggers a variety of occupant protection measures. The driver’s and front passenger’s belt tensioners are activated, and the windows and moonroof are closed. Following a collision, Active Protection automatically brings the vehicle to a standstill. The Frontal Collision Warning function detects an imminent risk of collision with preceding vehicles, and prepares the vehicle systems for a possible impact from vehicles behind. Driving stability systems Standard: DSC incl. ABS and DTC (Dynamic Traction Control), CBC (Cornering Brake Control), networked with xDrive all-wheel-drive system in Integrated Chassis Management (530i xDrive), DBC (Dynamic Brake Control), Dry Braking function, Fading Compensation, Start-Off Assistant.